As a School Association, we sponsor a child through World Vision. The child we currently sponsor is called Amie, who lives in Sierra Leone. We also help to support her local community. 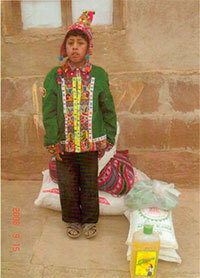 Our sponsorship enables Amie to have basic health care, clothing and education. We have made several extra gifts to Aimee’s community which have provided food, blankets and other equipment. We have received some lovely letters and photos from the community. Not only do we feel that we have been able to help Amie and her community but we feel that we are learning more about life in this part of the world.